Nov. 26, 2014 5:00 a.m.
Last week the City of Edmonton presented its case for the City’s proposal of annexation to the residents of the County of Leduc and surrounding communities with three open houses intended to resolve some of the questions raised by their proposal. On Monday, November 17th the first open house was held in the Nisku Recreation Centre with approximately 100 interested residents in attendance. The second open house was held in south Edmonton and the third in Beaumont with approximately 80 in attendance at each session. The meetings helped Edmonton to fulfill some of the requirements required by the mandates established by the province’s annexation processes. It was hoped during this phase of the processes to also address some of the fears and frustrations that have risen from the City’s annexation proposal. 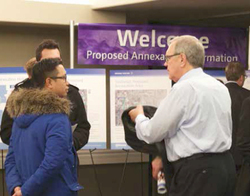 Unlike the open houses held in the spring these open houses were designed to provide residents with the statistics supporting Edmonton’s need to expand and the background of past annexation proposals. There were no speeches by Edmonton officials but residents were able to browse the various displays and ask question directly to the various city officials in attendance. Those in attendance were given packets that contained all the information that was on display and were provided an opportunity to sign up for the City’s newsletter regarding the annexation proposal. Among those taking in the Beaumont session were Leduc Councilor Clay Stumph, a member of the County’s liaison team, and County Manager Brian Bowles. The City did attempt to answer some of the questions raised in the spring meetings by having various officials from the Police, Transportation, and Fire Departments to explain the services their department provides and their mission and goals. Deputy Fire Chief Barry Lamb was available at the meeting in Beaumont and informed residents that the current goal of the fire department is to have at least one fire crew attending a fire within 7 minutes of notification and 90% of the time a crew of 16 firefighters are on the scene within 11 minutes is being accomplished. He was also able to provide the current Fire Rescue Services Master Plan to those interested. Of course the Master Plan was developed for the current boundaries of the City of Edmonton answers to questions regarding how the plan would be implemented for the area included in the annexation proposal were vague. The assumption was that future development would follow the same procedures currently in place and that Edmonton and the County of Leduc would negotiate in the providing of services during a transition period. Edmonton Senior Planner Tim Brockelsby stated that the current annexation proposal was made to meet the needs of the City’s growth for the next 30 to 50 years and is a complete package and not designed to be reduced. Edmonton and Leduc County have announced their municipal liaison teams and in the near future they will be meeting to address the annexation proposal hoping that they can find an amicable approach, which will be a benefit to both municipalities. Mayor John Whaley, Councilors Stumph, Tanni Doblanko, and John Schonewille represent the County of Leduc with Mayor Don Iverson, Councilors Bryan Anderson, Michael Waters, and Ed Gibbons representing the City of Edmonton.